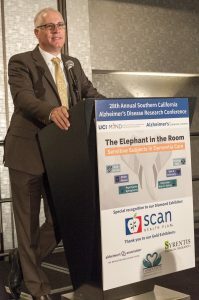 The annual Southern California Alzheimer’s Disease Research Conference, in partnership with Alzheimer’s Orange County, is in its 29th year of bringing to the community the latest clinical research in the field of Alzheimer’s disease and related dementias. Reaching a diverse audience of over 400 clinicians, researchers, students, aging-services providers, and caregivers, the conference brings together internationally renowned researchers and clinicians to address our nation’s progress in the battle against Alzheimer’s disease. Petersen – National Plan to Address Alzheimer’s Disease: What’s Next? Snyder – When the Diagnosis is Early-Stage Alzheimer’s: What Happens Next?